I spent Monday casting on for a Wedgewood shawl and binge watching The Umbrella Academy on Netflix. First, The Umbrella Academy, not my normal show but.... Sarah had watched it and thought I'd like it and she's normally right about that kind of thing. I'd seen it advertised but had turned it down. Time traveling, talking monkeys aren't my thing. But I am SO glad I listened to Sarah. I only have one more episode to go and I'm still totally confused and wondering what in the world I'm watching but at the same time, I am Loving it and can't turn it off. It's fantastic! Weird and confusing, but fantastic! Besides being weird and confusing, it's funny, heartbreaking and has awesome music. You should definitely watch it if you haven't already. Oh, and speaking of awesome music, I've recently discovered 'Mongolian metal' which I've fallen in love with. It's fantastic background music and it's playing as I type this. The current song sounds Scottish. Scottish sounding Mongolian metal?? Binge watching talking monkey movies?? Apparently the return to work has sent me over the edge. But back on topic.... The Wedgewood shawl. I mentioned recently that I wanted my next project to be knit with Capretta from Knit Picks. (#Affiliate) I knew I wanted a crescent shawl with some stockinette to show off the yarn's hand paintedness and a little bit of lace for umph. I have spent hours and hours checking out designs on Ravelry. Then yesterday, I finally decided on Wedgewood and wouldn't you know - I already had the pattern on my bookshelf! And now I have a cast on shawl and one more episode of The Umbrella Academy to watch. I'll see y'all tomorrow. I've seen that show's trailer on Netflix too and now I'll have to check it out. I love quirky shows. 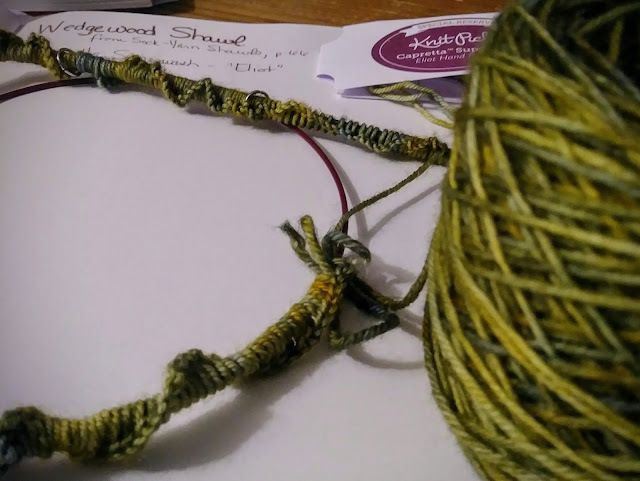 Can't wait to see the shawl come to life. That color is fabulous. Love your yarn color - so pretty. I had seen some previews for Umbrella and it just didn't appeal...but I may need to give it a try (as I continue to Embrace My Madness!!). We watched on episode and need to get back to it. I liked it enough but my husband was on the fence about it. I've heard good things though!! Love that green!! Give it another try. I found myself asking what in the world I was watching for the first couple of episodes and then I was 100% hooked. It's very confusing at first because there's so much confusing & seemingly unrelated things going on. Really? I've always loved Knit Picks. Their customer service has always treated me wonderfully and their yarns are affordable for those of us on a budget. Your Wedgewood link is to the Umbrella your tube. LOL I have been resisting it, but since we are the perfect roomies I am jumping in to watch it! Pretty greens are just right for spring. I'm off to look at the Wedgewood Shawl. I LOVED The Umbrella Academy! I thought it was brilliantly done, and it left me wanting more!